With the move of Cannery Brewing to a brand new location in Downtown Penticton there was an opening at the old Cannery Trade Centre. If you had ever been to the old location of Tin Whistle Brewing you would know how tight it really was (Take a look). The family that owns the brewery jumped at the opportunity to vastly increase their space. The brewery for one now has a full tasting room! They do not just have a little front entrance area! There are lots of possibilities for this space including the possibly for tables and chairs in the future (my ideas not anything mentioned to me) but they have just opened recently and are actively working out the kinks. The real beauty of this location though is in the brewery space. Where they moved from they were jammed into the space with nowhere to add anything. With this space they have room to both expand out and up! 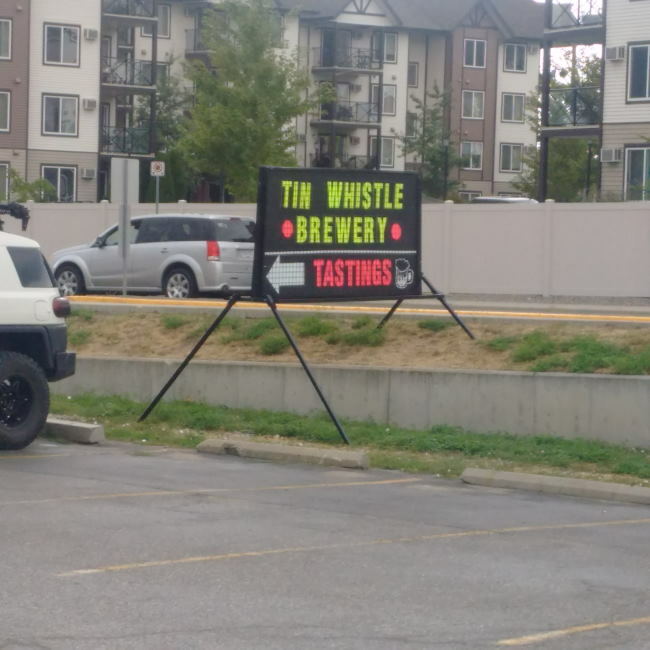 This brewery could really ramp up their footprint in the province if this new location really takes off! I am really looking forward to seeing how Tin Whistle Brewing manages their new much larger brewery and look forward to new and exciting beer! Congrats on the big move! This entry was posted in Brewery and tagged brewery, cannery trade centre, craft beer, craft brewery, move, penticton, relocate, relocation, tin whistle brewing. Thanks for stopping by the blog. I look forward to the future of your brewery there in Penticton!